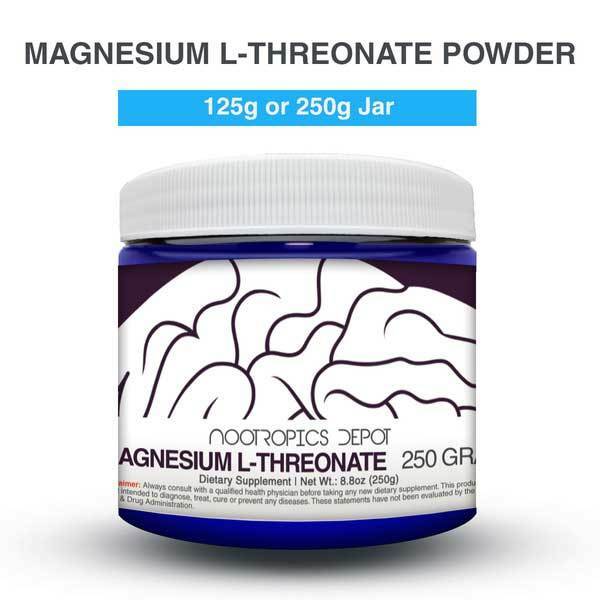 Magnesium L-Threonate Powder - Learn how to Feed a Brain! Various studies have shown that Magnesium plays an important role in regulating memory formation, mood and protecting the brain from various stressors. However, various other studies have also shown that Magnesium supplements, especially forms such as Magnesium Oxide, have a fairly hard time elevating brain levels of Magnesium to statistically significant levels, which is why Magnesium L-Threonate is currently the only form of Magnesium that will produce significant effects on overall cognition. When Magnesium reaches the brain, it mainly interacts with the NMDA receptors, which play a key role in the formation of memories. The NMDA receptor contains a specialized site within the receptor to which Magnesium can bind. When Magnesium binds to this site, it blocks the receptor, which prevents the receptor from activating. This protects the brain from the negative effects of overactivation of the NMDA receptor. NMDA receptor activation, however, is also vital for the formation of memories and this is where Magnesium has a unique effect. It increases the amount of NMDA receptors in the brain, whilst blocking background activation, which means that when the NMDA receptors get activated during memory formation, there will be a much stronger NMDA receptor response, leading to deeper and faster encoding of memories. WHAT IS MAGNESIUM L THREONATE? Magnesium L-Threonate is a unique formulation of Magnesium which was designed by a team of MIT scientists to specifically elevate brain levels of Magnesium. This makes it the best choice for individuals looking to reap the brain health benefits of Magnesium. The novel chelation of Magnesium with L-Threonate, a metabolite of Vitamin C, produces one of the most highly bioavailable forms of Magnesium currently on the market. This means that not only is a great choice for brain health, but it is also a great choice for supplementing a healthy diet with extra Magnesium, a mineral which many Americans are deficient in due to a lack of dietary Magnesium consumption.